For anyone living, working or just visiting South Korea, popular culture can sometimes be quite confusing if your not lucky enough to be able to speak Korean. However some things transcend the Korean language barrier and allow all to enjoy, and here are some examples: music, art, sport and comedy. One of the most popular programs is KBS2’s Gag Concert which is a sketch show filmed in-front of a live audience featuring many comedians as well as guest appearances from Korean celebrities. This sketch is about two close friends who are out on for a friendly meal when one drops a bomb by raveling that they invited some guests. It the episode the guests are Taeyeon, Tiffany & Seohyun from girls generation. This sketch features a number a characters all school students who have different problems. This sketch features a Gyopo Student who performs mainly in English. Here we have an overweight father and son who make a range of jokes making lights of there obvious weight issues. The Brave Guys have become so popular they ever feature on TV ads for car insurance. They are a 3 person group who offer advice in the form of rapping, singing and talking to a guy who is often having small issues. If you have any questions or comments please let me know and also you can watch Gag Concert every Sunday evening on KBS2 at around 9pm. Hi, I’m curious of the guy who speaks english on ‘school of mental breakdown’ skit. Do u know his name? Thanks in advance..
Do you know how it is possible to participate in a show? I mean how can I come to see live?? 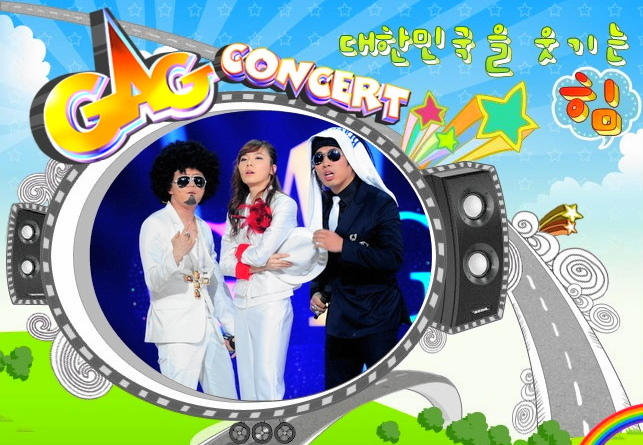 As you know Gag Concert is one of the most popular live TV shows in Korea and therefore tickets are limited. However I’ve seen them for sale on Groupon or you would need to contact KBS directly. Sorry we can’t help more.